Where Did The Wedding Ring Bearer Tradition Come From? Here at WhereBridesGo.com, we are all about weddings! Occasionally, we like to look back and find out where some of the things that we associate with weddings originally came from. 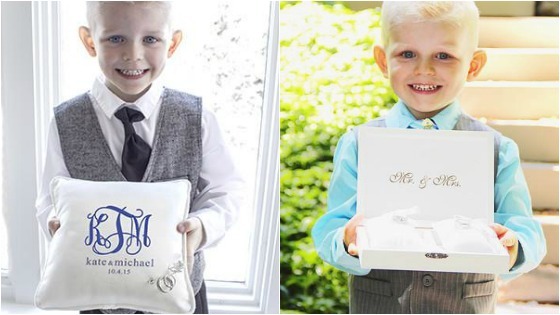 After looking through our selection of ring bearer pillows and ring pillow alternatives, it got us wondering how the tradition of having a ring bearer began. Here's what we found out. The ring bearer has the very important job of getting your brand new wedding rings safely down the aisle. This role is usually given to a young boy that is a family member or a friend's child, often under the age of ten. Due to the age factor, couples usually choose to let the ring bearer carry symbolic rings rather than the actual wedding rings. The guests can't tell the difference, especially when the pillow or box that he's carrying is as adorable as the young man. This wedding tradition has been around for a very long time in many countries. In ancient Egypt, treasured jewels were carried on ornamental pillows during wedding ceremonies, which is very similar to what we do today. Traditionally, couples would have their initials or names embroidered on the pillow where the rings were to be placed. Ribbons sewn onto the pillow were tied around the rings to hold them in place. Nowadays, many couples prefer to use a beautiful, personalized box to hold the wedding rings. 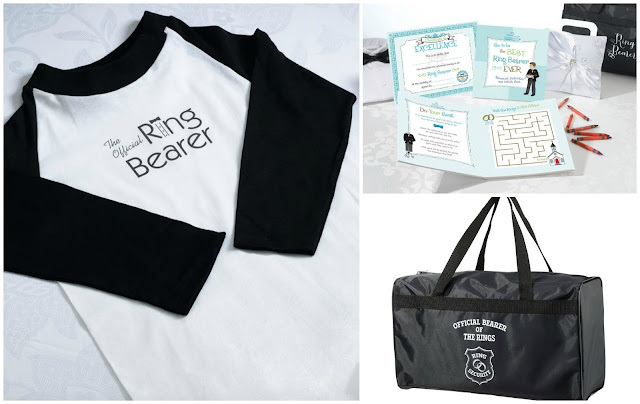 You can find a wonderful variety of different types of things for your ring bearer to carry down the aisle in our online wedding accessory store. As a matter of fact, we've even got something for the bride and groom that prefer to have their four-legged friend take over the ring bearer role! You'll want to give the special young man that carries your precious wedding rings (or replicas of them) down the aisle something to thank him for his part in your special day. 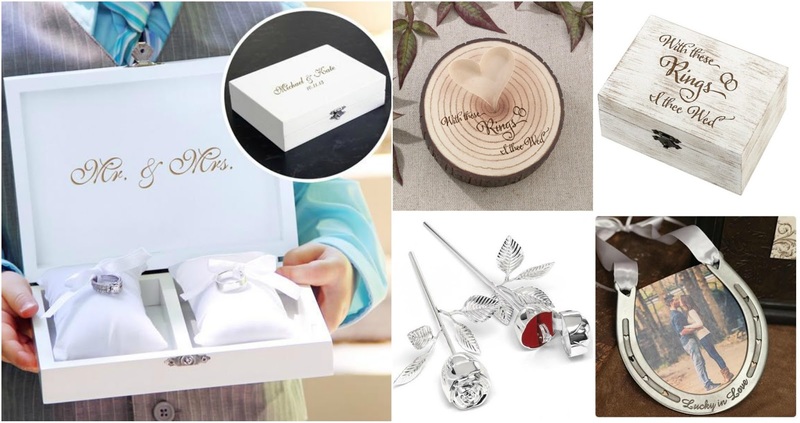 WhereBridesGo.com has all kinds of adorable items to give as thank you gifts. From "Ring Security" duffel bags, to clothing, to activity kits to keep them busy during the boring "grownup" wedding stuff, there's something there he'll love. 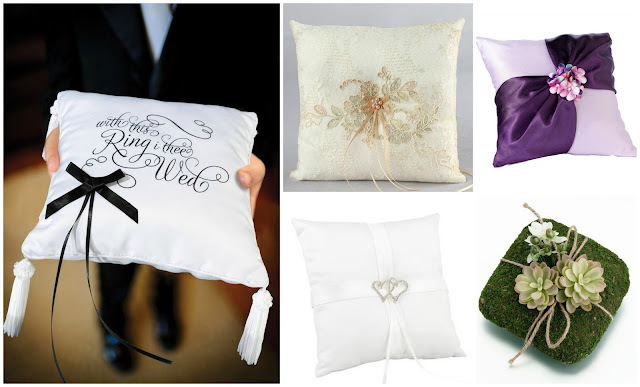 When you're ready to pick out your ring bearer pillow, as well as all of the other items to make your wedding amazing, take a look through the pages of our online wedding store and create the wedding of your dreams with a little help from us!